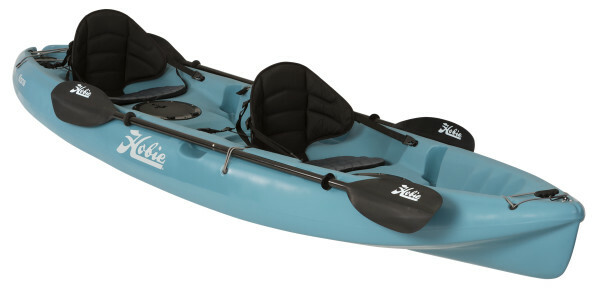 The Hobie Kona is a classic crossover paddle kayak. 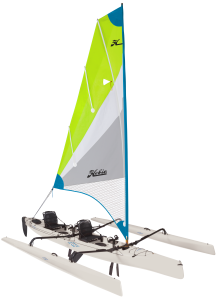 In two-person configuration, it provides a stable ride and snappy, spin-in-a-second performance; when paddling alone, the boat’s molded center seat keeps the boat well trimmed and responsive. The Kona’s rotomolded polyethylene hull couples a wide beam with a relatively short waterline, delivering the responsive, stable performance usually found on longer boats. Carrying handles and on-hull paddle storage simplify portaging, and the deluxe, adjustable padded seats support your back and encourage longer excursions.